Dr. Gary Kraus, MD, is a neurosurgeon in Houston specializing in non-surgical, spine surgery and minimally invasive spine surgery, with offices in the Woodlands and Kingwood areas and Humble. At KBNI, your health is our primary concern! MISS has changed how neurosurgeons treat painful spinal disorders. Read about the potential benefits for yourself. Informative, brief video help you to better understand new techniques that speed recovery time. Do I Need Spine Surgery For Back/Neck Pain? Do you have acute, chronic or radicular back or neck pain? Don’t let back pain mislead you! Sometimes pain is intense yet the cause is minor. Find out what you should know about spine pain. Do I Need Surgery For My Herniated Disc? Did you know a disc can herniate spontaneously or incidental to injury, repetitive movement or degenerative disc disease? 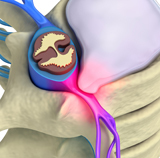 Learn how symptoms differ between a cervical and lumbar herniation. Video included!